The MetalAce Imperial Line, also known by the name Right Angle Tool Div, feature cast ductile iron frames that provide sturdy vibration free units with the rigidity you expect from a cast frame. The MetalAce Welded Frame Line's welded tube structures have the right amount of rigidity and spring tension for smooth transitions of metal thicknesses on panels. We invite you to shop and compare. Our range of models offer choices in leg design, a huge selection of anvil wheels, more attention to detail, service second to none, affordable prices, rigid iron frames and other benefits too numerous to mention. Our English wheels are used by NASCAR® race crews, home hobbyists, aviation and auto restorers, custom motorcycle builders, autobody shops, garden artists, sculptors, HVAC businesses and about anyone else shaping metal. We’re the most copied manufacturer in the industry. That’s because we’re innovative. Please be cautious as you look at cheaper “knock-offs.” Differences in quality aren’t always easily visible. 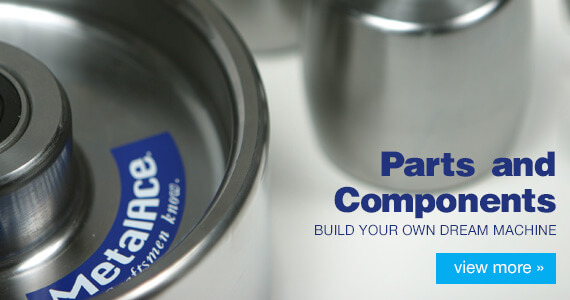 With MetalAce, you will get more results with less effort than with any other manufacturer and a name you can trust. We invite you to become one of our satisfied customers. Our heavy welded steel frames are finished with a tough powdercoat paint to withstand the demands of a metal fabrication shop. Gusseted construction ensures the frame will always stay rigid and perform the same for years on end. The crucial components on each model are adjustable to allow the machine to be trued to factory perfect tolerances at any point in the machine's lifespan. These same adjustments allow for some more complex metalshaping procedures as well. The attention to detail throughout the lineup creates an easy-to-use machine that produces results quickly while the operator focuses on the work at hand, not the machine. Rasmussen used his MetalAce machine to replace panels on two antique aircrafts. 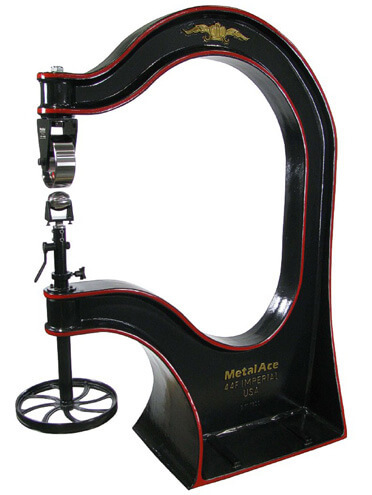 Coming from Legendary Gasoline Alley in Indianapolis, I see a lot of shaping tools and MetalAce brand is the “cream of the crop”. The unique anvil wheel designs are extremely witty and helpful with those tight spots. The frames have the action of a finely tuned fiddle. Knowing that a craftsman is only as good as his tools, I use the Imperial 28F machine on every single build. 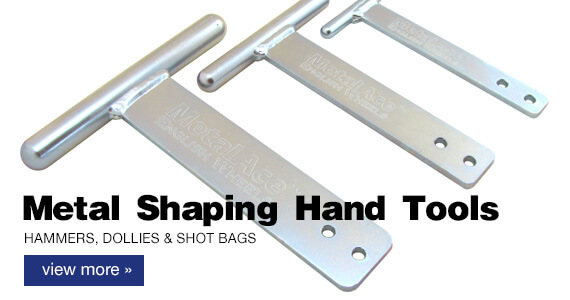 MetalAce machines are built with serious precision and integrity, and with every stroke those features are carried through the shaping process directly into the parcels that they bear. Hart of Chopsmiths, uses the Imperial 28F machine to build hand made motorcycles. This is my third English Wheel and my last one. The reason for three is not that I wear them out, it’s just like stepping up better and better each time. The first one I hand built 20 years ago (a time when very few people knew what a English Wheel was). The next one (a red one) was purchased from down south and now the third, I have the quality I have been looking for, from MetalAce. I started out in the Auto Restoration field over 25 years ago and it seems the longer you are in business the more you diversify and grow. Now, not only am I doing rods, classics, and muscle cars, I am also doing work on aircraft parts and motorcycles. So having versatile tools allow you to do the work you might have avoided previously. As you can tell I am extremely pleased with my wheel from MetalAce. Jim Rettick is a very knowledgable and competent person who talks sense and is always striving to be better. A first class individual. Bangasser of Mackinaw Valley Restoration, purchased a MetalAce machine to restore autos, aircrafts and motorcycles. Keith Daleen of Sedalia, MO had just had enough. As an avid hobbyist focused on rebuilding old cars, he was consistently disappointed with the ill-constructed, foreign-made replacement panels he was buying. Daleen ordered a 44F U-weld kit from Covell in September 1997, but the shipper was on strike. So, Covell, who distributes the MetalAce, told Daleen to ship directly from MetalAce, which is located not so far away in Illinois. The U-weld kit for the 44F call for a 3” support steel frame, but Daleen believes “bigger is better”, which he uses as his rationale for buying the 44F, and for justifying moving up to a 4”, 1/4”-thick steel frame. “It’s solid,” he says, particularly with the four legs under vs. most manufacturer’s three legs. Today, Daleen has rebuilt seven cars since his purchase of the MetalAce 44F English Wheel. But, his reputation is also getting around. He stays busy building parts for others, namely rust panels, door skins, fender patches, lower rear body panels and transmission humps for cars. In the motorcycle world, he has fabricated aluminum fenders for a 1955 Harley Davidson and aluminum air shields for racing bikes. He’s also used it to remove “dings” from fenders of cars. “It’s a lot quieter than beating them out with a hammer,” he laughs. To Keith Daleen, serious hobbyist, the MetalAce is the perfect tool for this equally serious craftsman. Daleen has rebuilt seven cars since his purchase of the MetalAce 44F English Wheel. When Rick Smith went shopping for an English Wheel, this discriminating hobbyist knew what he was shopping for. For nearly 20 years, Smith had been intrigued by the English Wheel. For years, his metalcrafting and shaping emanated from the hammer and dolly method. It was at the Experimental Aircraft Association (EAA) annual Oshkosh,WI fly-in that Smith first found the English Wheel in use. The EAA traditionally features not only precision flying demonstrations, and other aircraft exhibits, but also aircraft construction and maintenance workshops. When Smith saw the English Wheel being used, he knew he had to have one. Over the years, he talked with a number of individuals and manufacturers about what he wanted. But, as he talked to them, many of them readily admitted to him, “If I had to do this over again, I’d change this or improve that,” etc. He knew even the owners and manufacturers weren’t totally satisfied with their products. Prior to seeing what Jim Rettick was manufacturing, Smith thought he would have to build one in order to get a quality machine. But after seeing the care, quality and extreme precision of construction and manufacture of the entire machine and studying its features, he decided to purchase a 44F floor model. He is very pleased that he did, because it has exceeded his expectations. To date, Smith has completed two pieces of sculpture and helped coach the Bradley University Engineering Department on using the MetalAce 44F to build the aluminum body of its experimental race car. He is currently busy restoring two antique airplanes. The planes are 1930’s Great Lakes biplanes, and feature a bump cowling over a 7-cylinder engine. In order to blend the cowl to the fuselage, it requires compound curved fairings and the 44F is perfect for shaping them, as well as other aircraft parts. If you’re a craftsman like Smith is, you know that if you want to shape the finest parts with an English Wheel, you have to have the finest tools and there are no better machines made than the MetalAce® line. Smith has completed two sculptures, restored two antique airplanes and helped engineers at Bradley University use the MetalAce 44F to build an experimental race car. Since 2000, the WyoTech Street Rod & Custom Fabrication program located in Laramie, Wyoming has used MetalAce English Wheels combined with frames fabricated by our students and staff. The MetalAce wheel fits our needs as an affordable entry-level shaping tool that stands up to the punishment of these first time metal shapers. As the school has grown, so has our demand for the product. MetalAce wheels are now also used at campuses in Blairsville, PA, and Sacramento, CA. Casper of the WyoTech Street Rod & Custom Fabrication program bought MetalAce products for students at the school.